One of the best parts of having chickens is all the fresh eggs. Eggs are super versatile and delicious and can be used in so many different ways. The only downside is sometimes fresh eggs can be difficult to peel. Thankfully, there are a few ways to easily hard boil fresh eggs so the shells don’t stick. They peel beautifully and make delicious deviled eggs, egg salad, or potato salad! Last week I wanted to make Russian Carrot Salad from Penniless Parenting. I’m not a huge fan of carrots but I do like them cooked and I DO like potato salad and this reminded me of a potato salad. My biggest stumbling block was I have heard that it’s near to impossible to hard boil fresh eggs and be able to peel them. I didn’t want to BUY eggs when I have a couple dozen just sitting on my kitchen counter and I didn’t want to wait for my eggs to get old enough to peel easily. Thankfully google came to my rescue and I had a plethora of recipes to choose from. It seems like all the “tricks” to make fresh eggs peel better when hard boiled have varying results. I decided to try steaming my eggs and I was super excited when they all peeled beautifully. Now I know how to hard boil fresh eggs! I was able to make my carrot salad and it was delicious. And that’s it! Hard boiled eggs are awesome in carrot salad, potato salad, quiche, or for deviled eggs. Whenever I have an excess of eggs I like to hard boil a batch of them to use throughout the week. They are even delicious all by themselves (although I’ve yet to convince my children of this). If you REALLY have a gluttony of eggs you can hard boil them and add them into your chickens diet to increase their protein, which can be helpful if they are going into a molt. More Tips For Making Fresh Eggs Easy To Peel! If steaming isn’t your favorite way to cook your eggs, you can let them age first. An egg left out at room temperature ages quickly, so by three days it’s about as old as the three week old eggs you buy from the store. This means that the membrane has more air between it and the white and thus will not stick to the egg as much. If you don’t want to wait until your eggs age a bit, you can also try an ice bath after boiling or steaming. Boil your eggs for 15 minutes or steam them for 20. As soon as the time is up, remove them from the pot of hot water and place them in a bowl of ice cold water. How do you hard boil your fresh eggs? Have you tried steaming them before? How did it work out for you? Share in the comments below! I never tried steam boiling, that is a good idea, I’ll have to try that! *sigh* I love when you post anything to do with chickens, but I get sad, too, because I don’t have any (yet!). This is pinned and ready for when I do. I’ve tried all sorts of ways to boil fresh eggs. All failed, including your steaming method. I finally found one that works for me. Place the eggs in cold water in a pan. Boil for 5 minutes. Using a potato masher or something similar, gently press on each egg until the shell cracks. Continue to boil another 5 minutes. Place eggs in icy cold water until cold. This is the only method I’ve found that works every time for me. Thank you so much for the idea to steam fresh eggs. Oh my goodness. It worked beautifully!! 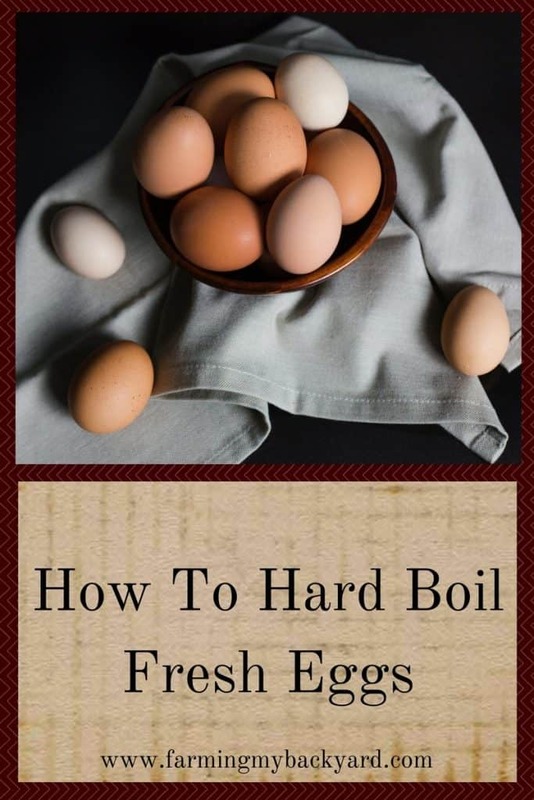 I have tried numerous ways to boil farm fresh eggs to no avail. This is a game changer. Easy and eggs peel perfectly.